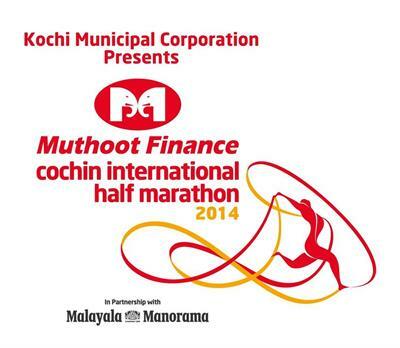 Cochin International Half Marathon 2014 online registration will start from 1st October. With total prize money of Rs 65 Lakhs, the Cochin International Half Marathon 2014 will be a mega event with around 25,000 people participating to win the titled. It is expected that participation from 20 foreign athletes, high profile male, female and local residents will take part in the second edition of the Half Marathon. The stage is set for the second edition of Cochin International Half Marathon. After the grand success of the 1st Cochin Half Marathon, the city is gearing up to welcome athletes from around the world for yet another mega international event. Cricketer Harbhajan Singh and Malayalam actor Mohanlal will be the brand ambassadors for the Marathon which will be held 7th December 2014. The registration process will start from 1st October 2014. Considering the ongoing Kochi Metro works, the marathon will take a slight detour. It will be flagged off from Marine Drive, proceeds along Fort Kochi and ends at Maharaja's College ground. Considering the overwhelming response from the local people and participants, the total prize money for this year has been raised to Rs 65 Lakhs. Separate prize fund will be arranged for the Indian athletes. Around 25,000 people including participation from 20 foreign countries, high profile male, female and local residents would run through the heart of Kochi in the upcoming Marathon. More than winning the title, the Keralites would get a chance to brush their shoulders with globally renowned long distance runners. $5,500 each will be given to the male and female winners while runners-up can take home $3,250. Runners who makes into the first eight places will receive prize money. Adding to it, the fastest Indian man and woman athlete will be given Rs. 2 lakhs each and runners-up Rs. 1.50 lakhs. The men and women participants who break the existing overall course records which stand at 62 minutes and 54 seconds set by Kenyan Bernard Kipyego and 71 minutes and 54 seconds set by Helah Kiprop Kenyan woman athlete will be gifted with $1,500 as performance bonus. Any Indian who betters the 64 minutes and 37 seconds set by G. Lakshmanan will be awarded Rs. 1 lakh. An additional bonus of Rs. 50,000 will also be given for an athlete who finishes below 65 minutes. Apart from the open half marathon, the 21.097 kilometres relay event for corporates and 10 kilometre timed run for amateurs will be added this year. A 7-kilometre run for people from all walks of life aged above 13 years are also arranged to increase the participation. Certified by the Association of International Marathons and Distance Races, this running event is being conducted under the aegis of the Athletic Federation of India. The technical conduct of the Marathon is entrusted with the Kerala State Athletics Association while the event is promoted by Push Integrated Communications and managed by Push Aryanz Sports Events. The main moto of Cochin International Half Marathon 2014 is to promote healthy and fit lifestyle.